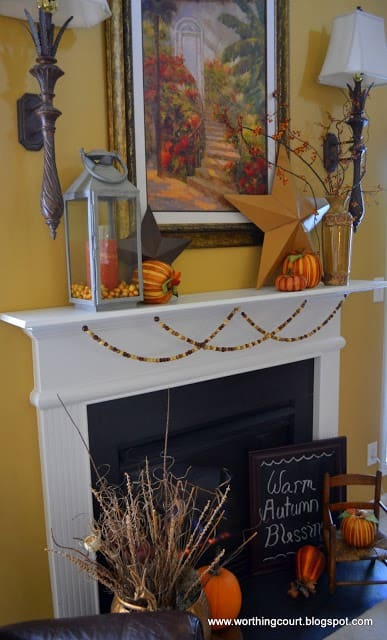 I had a lot of fun putting the Fall decorations together for my mantle and hearth this year. 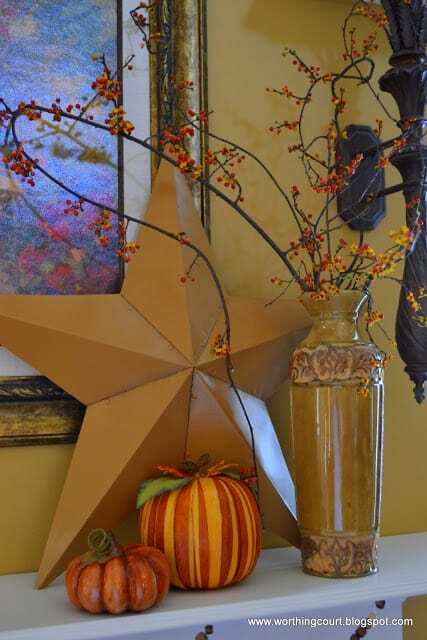 When I came across some metal stars in my stash, I decided that a bit of a rustic look would work well with Fall decorations. I already had most everything in my stash. The only thing that I purchased is the bittersweet. Good grief, that stuff has gotten so expensive! I just love the gnarled branches of bittersweet. Too bad I don’t have place to try to grow some in my yard. Did you know that spraying hairspray on it will help it to hold its berries? You can use that little trick on dried foliage too. I was happy to be able to reuse the wooden bead garland that I made last year. 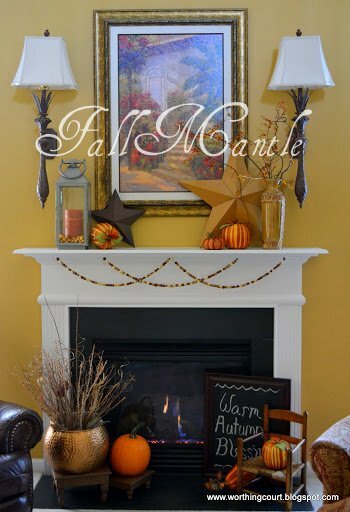 Click HERE to see my last year’s Fall mantle. It looked a lot different. I spray painted an old container that I had lying around with copper paint and filled it with dried woodsy stuff. The Pottery Barn cheese stands that I found on our shopping trip to High Point came in handy for elevating the container and a pumpkin. Do you name your furniture? This little chair is named “Joan” and has been in my family for over 100 years. The worn front and scuffs are evidence of all the love that it received over the generations. My mother tells stories about pushing it around on the cobblestone floors in her house when she was a toddler. Many a tiny bottom has made itself at home in this little chair. ☺ I wouldn’t change a thing about it! On a crisp Fall day, give me a cup of hot chocolate, a good book and a blanket and I’ll be all set right here in front of the fire for the day. 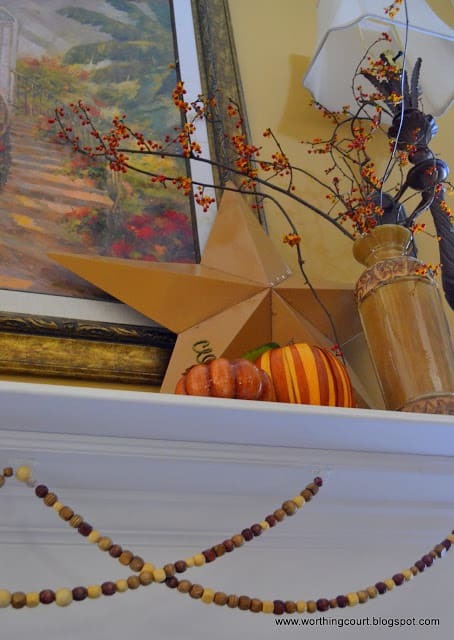 Suzy…your mantel is so beautiful…love those stars and the bittersweet!…There is such a warm and cozy feeling to the mantel and hearth….love it! I love the beads! the stars look fabulous and brings in the rustic touch! very warm and cozy area! 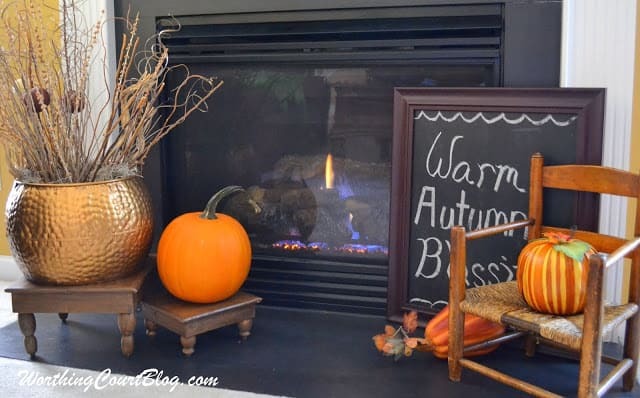 Your mantel is so cute I love the little chair on the hearth with the pumpkin. Suzy, your mantel is so pretty! Love the little rocker, too! It’s such a sweet, sentimental piece. Everything feels so warm and cozy! It looks lovely and warmly inviting, Suzy. The bittersweet is so pretty, & that’s a great tip about the hairspray. I really like your lamp sconces — very pretty! 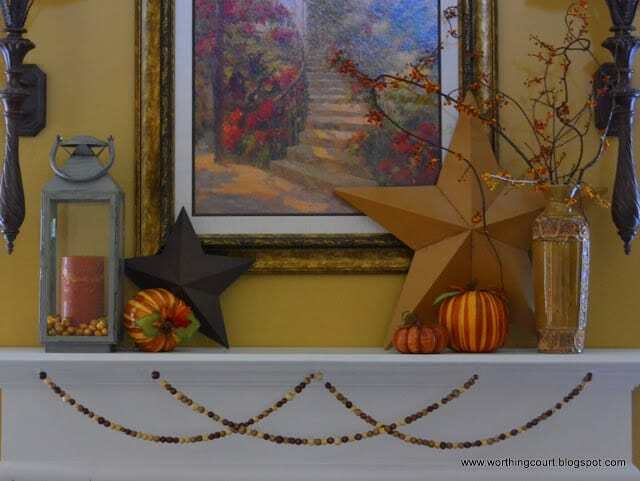 Suzy, I love your fall mantel with the stars, the beads, and the bittersweet! And little “Joan” makes it complete. Had a great time at the conference and I’m so glad we finally got to meet! 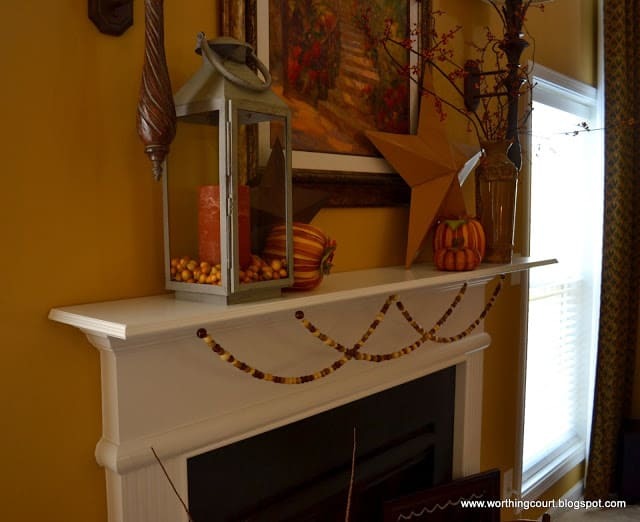 Great looking mantel for Fall, each element goes so well on the mantel and the beads are too cute. Your mantel looks great! The cheese stands are the perfect little pedestals for your pumpkins. 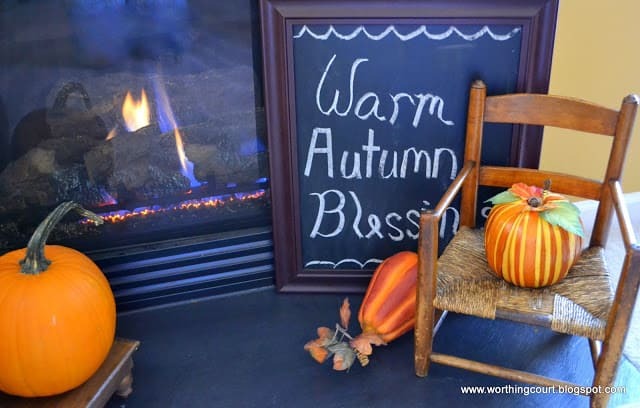 Beautiful fall hearth! 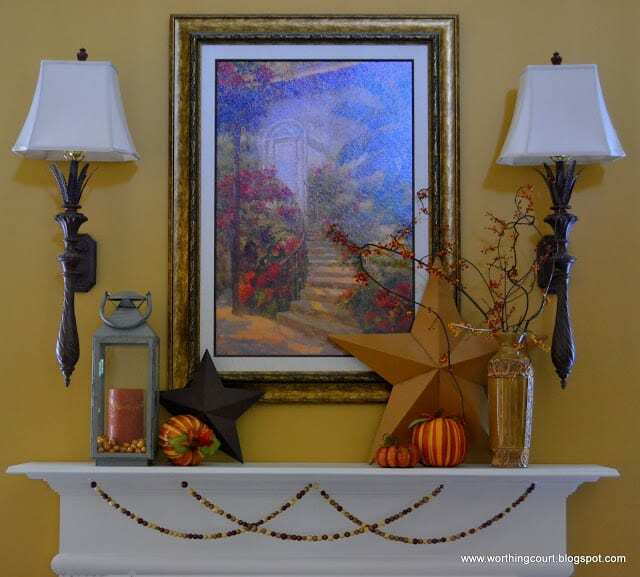 Your mantle looks so pretty – love those tiny little stools!! I love your fall mantle, especially the beads. What a beautifully simple touch! I am following you on facebook, pinterest and twitter now. Have a wonderful week!